Steven B. Johnson is the author of ‘Where Good Ideas Come From‘ and ‘The Invention of Air‘, among other best-selling books. For more information about Steven B. Johnson’ work, check out his homepage. 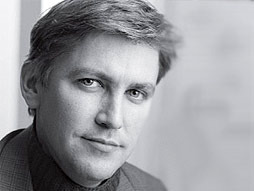 In 2010, Steven B. Johnson spoke at TED about the where good ideas come from. You can see that TED talk here. 1) There are seven patterns of innovation that appear over and over in culture AND in nature. Steven Johnson explains that innovation and creativity are fractal: they occur by following the same seven patterns throughout the world, whether it’s a city or a coral reef. Culture evolves the same way nature does. More importantly, the world proves in both settings that innovation has its best chance of happening when ideas are connected, not protected. We usually romanticize the generation of new ideas. We like to believe in that breakthrough moment where one enlightened individual jumps ahead many generations with his idea, but reality is quite different. Ideas are are connected like doors. Open a door and you can see new ideas, but only ideas that are connected can be seen. It’s by learning from other people’s ideas, or previous ideas of our own, that we come up with new ways of seeing the world. It’s a constant connection of innovation. The reason ideas that are truly disconnected fail, is because there’s no connection with the present yet, there’s no application in reality. These ideas are frequently called “ahead of their time”. The key is not to isolate your room – your idea. Instead, try to connect it to as many doors -people, places, ideas – as possible. Ideas are not single elements. They are more like networks. They are not sparked by the connections between different elements: they ARE those connections. For ideas to happen, you have to place the elements at your disposal in environments where more connections can occur in the right way. The best networks have two characteristics: they make it possible for its elements to make as many connections as possible, and they provide a random environment that encourages constant “collisions” between all of its elements. This is why “liquid” networks are the best. They provide more stability than gas, where there’s not enough time for meaningful connections to happen, and less rigidity than solids, where there’s not enough randomness. Remember, the elements are worthless if they are not properly connected. A trip to the beach with your co-founders will provide more creative ideas than you working alone in the office with all your spreadsheets. It takes time for ideas (hunches) to connect and evolve into something valuable. Patience and contemplation are key aspects of innovation. If it feels completely new, chances are it’s not that valuable. In other words, it takes time to open all the necessary doors in a network that lead to an innovative idea. Many slow hunches never turn into something useful because our day-to-day matters usually get in the way. We forget them before we give them a chance to make connections and grow. This is why a commonplace book is such a valuable tool. By collecting every bit of interesting information, you have a place where connections can be made, where every review will reveal something new. Bottom line: Write everything down, and let it bloom. Innovation can’t be planned. Elements are not always in sync with each other. Ideas sometimes arise from happy accidents, hunches connect in an unexpected way. This is the problem with brainstorming sessions: maybe the best idea pops up to one employee later that night, long after the session ended. The secret to help serendipity occur is to build networks where its elements have a chance to persist, disperse and re-connect. This is how doors that weren’t seen before get opened. However, something else must happen: the discovery must be meaningful to you. Constant bouncing of elements means nothing by itself, there must be a purpose in mind. Building an environment where brainstorming is constantly running in the back is the ideal way to go get serendipitous. Maybe have a database of hunches, were ideas can slowly connect with each other without having the time-pressure of a meeting. Good ideas are more likely to emerge in environments that contain a certain amount of noise and error. Noise and error leads to unpredictability, which in turn leads to innovation. Attempting to eliminate every uncomfortable element of the network also means eliminating every unpredictable connection. The reason failure is not a bad thing is not because mistakes are good, but because they are critical steps that one must go through in order to create something valuable. Avoiding failure at all cost is a costly stance. Failing fast and moving on to the next thing is a much better philosophy. The more connections the network encourages, the more diverse the purpose and usefulness of something becomes. For example, in an error-free environment, a match is a way to light the stove. However, introduce a blackout, and now it’s a way of lighting up the room. Exaptation is all about exploring more uses of already existing ideas. The reason cities are better suited for innovation than small towns, is not only because there are more elements, but because the amount of elements is enough for subcultures and diversification to appear. This is the essence of exaptation. Elements connecting in a variety of ways large enough to create unpredictable combinations. If adaptation is about ideas changing to tackle a clear problem, exaptation is about ideas accidentally tackling unforeseen problems. Improve the connections and amount of elements in your network, and you’ll have better chances of achieving exaptation. The advantage of platforms is not needing to monopolize creativity. By creating a platform, innovation can come from anywhere. Every time a platform is built for a purpose, that platform serves as platform for other agents for new purposes. New ideas appear where platforms are open. For example, companies like Google and 3M are great examples of cultures where everything in order to have a consistent stream of ideas from the most unexpected sources. The main benefit of having a platform is to create an environment where all the other patterns of innovation can thrive. Platforms generate ideas not only by fomenting specialization and diversity, but also by making it easy to “recycle” and reuse existing resources. By having an actual place (even if it’s virtual) where elements can connect, every resource is open for grabs. Imagine all the data that a platform like Facebook gathers nowadays that isn’t being used yet. It’s only a matter of time before some other element that’s involved in this platform finds a use for it. In the end, platforms encourage team work. They show that it’s better to share than hide. They tell us that we don’t need to know everything. We can focus on one thing and wait for the platform to provide the rest. 9) Ideas have to be fully liberated to spark innovation. The fourth quadrant of innovation is the best situation for this. The best environment for ideas are open-source environments, where ideas can be built upon and reshaped as needed by many people. This scenario is what Steven Johnson calls “The Fourth Quadrant”. There are four quadrants of innovation: individual/market centered, non-individual/market centered, individual/non-market centered and non-individual/non-market centered. History shows that the closer we get to the fourth quadrant, that is, the less money driven and individualistic the environment, the more innovative the ideas become. This doesn’t mean it’s bad to be creative with individualistic goals in mind. However, it does mean that it’s best for society when we open up our ideas to everyone instead of keeping them to ourselves. It’s interesting to see that this quadrant wasn’t always the best suited for innovation. In the Renaissance, the third quadrant (individual/non-market) provided more innovative ideas. The reason was that networks were slow and unreliable, and the entrepreneurial spirit wasn’t developed yet because there wasn’t enough economic incentive. Not surprisingly, the idea of the lonely genius is born during this time. By the time Gutenberg’s press and postal systems across Europe bloomed, and population densities in European cities increased, collaborative environments provided most of the innovation. This has only accentuated nowadays with even more collaborative tools like the internet. 10) Connections and spillovers are the natural state of ideas, while societal and artificial dams keep them in chains. Ideas naturally gravitate towards the fourth quadrant. Although we may be inclined to believe that the lack of economic incentives of the fourth quadrant would be a turn-off for innovation, it’s actually those economic incentives that become an obstacle. With the promise of a payday, people are motivated to have good ideas, but they protect them instead of sharing them. Our “market of ideas” is inefficient, because we have created artificial dams, such as copyrights and patents, that are designed to keep ideas out of other people’s grasps. However, this does not mean all restrictions should disappear. The lesson is this: we should stop believing that without economic incentives or artificial scarcity of intellectual property, innovation would disappear. On the contrary, strictly speaking about innovation, it would thrive like never before, although probably with a huge economic trade-off that is not desirable either. There is a balance worth pursuing. Remember, there is nothing “natural” about intellectual scarcity. It’s all artificial. Ideas not only thrive in open environments: they seek it. Sure, competition has been a great source of ideas. But so has the crowd. When looking at your own environment, embrace the random, connected, full of mistakes and hunches, diverse and non-competitive philosophy of the fourth quadrant. This entry was tagged creativity, Design, education, ideas, TED. Bookmark the permalink.